When many people think of “Brazil,” they immediately picture Rio de Janeiro. But Brazil is a huge country—the fifth largest in the world in area—and quite diverse in weather, geography, and culture. This truly is a country which has something for everyone. While Brazil is not as cheap as many other Latin American countries, in most areas it isn’t expensive by North American standards either. If you shop around for a reasonable rent and select a town where you don’t need a car, you’ll find that you can live well on a modest income. Besides, retirement shouldn’t be simply about watching pennies, but about enjoying life—something you can certainly do in Brazil. The weather in most regions is warm or temperate year-round. The food is fresh and tasty—and generally inexpensive. Brazil has a rich culture which has managed to embrace European and American influences without being unduly diluted itself. But my main reasons for choosing to live in Brazil—and you’ll often hear other expats here say the same—are the incredible natural beauty of the country, and its people. The Brazilian people have a well-deserved reputation for being warm and welcoming. If you followed the news surrounding the recent World Cup, you no doubt heard visitors mention this fact again and again. For many, Brazil is a great place to retire. For many others, it’s a wonderful place to spend part of the year or to have a second home. But, given the expanse and diversity of this largest of all Latin American countries, where should you look to retire? To give you just a taste of what Brazil has, I’ve selected three locales: one fair-sized city, one beach town, and one mountain enclave. If you don’t want to give up big-city amenities and conveniences when you retire, then consider Curitiba. The capital of the state of Paraná and the largest city in southern Brazil with a population of about 2.5 million, Curitiba consistently scores well on measures of livability such as the UN’s Human Development Index. Its hallmarks include a healthy, diversified economy and forward-looking urban planning. Curitibanos, who are of Portuguese, German, Northern Italian, Polish, Ukranian, and Japanese descent, among others, are educated, prosperous, and polite. This ethnic diversity means that you can find restaurants of every ilk, and festivals throughout the year which celebrate the various immigrant groups. The Festa da Uva (Grape Festival) is one of the largest. Curitiba is organized and clean. It possesses a good infrastructure; its BRT (Bus Rapid Transit) system in fact has been a model for several other cities. There are sometimes traffic snarls, but I suggest that you go car-less and take the bus, as have many locals—with the result that Curitiba has a high air-quality index. A one-way fare is only about $1.25. You’ll find several large shopping malls here, as well as universities and regional hospitals. Curitiba offers more cultural events and activities than most Brazilian cities. There are several museums, including the Oscar Neimeyer Museum, which honors the architect who designed Brasília. Curitiba also has several parks and protected woodlands. Perhaps the favorite is Tanguá Park, where locals flock on weekends to take exercise and eat ice cream, which seems to be a local obsession. 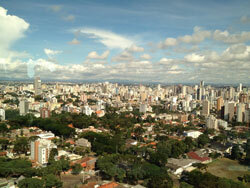 While Curitiba is located on a highland ridge, it is not far from the coast and beaches. In fact, a scenic train runs through a remaining swath of the original Atlantic Forest to the coast. Located at the other end of Paraná, but well worth the trip (I’ve been three times), are the waterfalls of Foz do Iguaçu, which without a doubt ranks as one of the foremost natural wonders of the world. Simply breathtaking. While the per capita income in Curitiba is well above the national average, the city remains affordable. A three-bedroom apartment located a bit outside the city center, but still near a bus line, might run $700 per month, while a one-bedroom would be about half that. You can enjoy a quality lunch at a por kilo (pay-by-weight) restaurant for $7. There are many forms of free and inexpensive entertainment. The principle drawback to Curitiba for some would be its weather. Located in the south and at some altitude, Curitiba’s winter is chilly, with average lows in the mid-40s F in June and July. However, summers are lovely, with highs typically in the high 70s. Curitiba has two airports and is readily accessible from Rio or São Paulo. It would be relatively easy for retirees used to First-World living, and who don’t wish to give up big-city amenities, to transition to life in Curitiba. I’ve written about Cabo Frio and the surrounding Lakes Region before on this website, and my affection for this small coastal city has not waned. 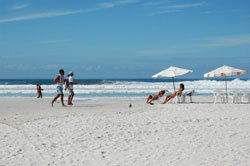 It’s only two hours by good highway from big-city Rio, but in Cabo Frio the ambience is calm and laidback. 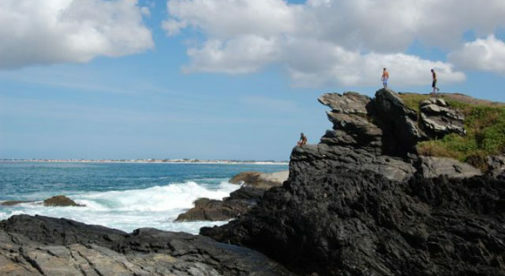 Cabo’s centerpiece is the long, broad, and exceedingly clean Praia do Forte (Fort Beach). A network of lakes and lagoons lie just inland all along this stretch of coast. As a result, you’ll find water sports of all kinds, from fly fishing to kite surfing, and everything in between. With a population of about 200,000, and as the largest city in the Lakes Region, Cabo offers most of what a retiree might need day to day. For anything else, Rio is a short bus ride away. It is easy to navigate and to get around Cabo. Your feet will likely be your primary source of transportation, but taxis and buses ply the major streets. Less than 10 miles away is the tres chic resort of Búzios, which is expensive to live in, but lovely for a romantic weekend getaway. Nearer still is tiny Arraial do Cabo, a fishing village from which boat tours depart. On your five-hour tour you’ll pass a floating restaurant, gorgeous beaches accessible only by boat, and the strikingly beautiful blue grotto. Local buses run to both Búzios and Arraial. Cabo isn’t dirt cheap these days due to its popularity as a destination for weekenders and seasonal tourists. However, if you take an annual lease and eat where the locals eat, you’ll find that you can enjoy sun and surf without straining your budget. You can rent a two-bedroom apartment for about $700 a month. A basic Brazilian lunch will run you $10, and a generously portioned meal for two along the canal’s restaurant row will set you back $50 to $60. Cabo’s principle drawback is that it becomes quite crowded during high season, which runs mid-December until after Carnival. This might be a fine time to visit folks back home. In a country with literally thousands of miles of coastline, choosing one beach town from hundreds is an onerous task. While I would stand by Cabo Frio for year-round living, João Pessoa in the northeastern state of Paraíba would be an excellent choice for snowbirds. In particular, I love how the strand within the city has been structured for exercise enthusiasts. Canela lies in the Serra Gaúcha, the highlands of Brazil’s southernmost state, Rio Grande do Sul. While you’ve likely never heard of Canela, the Serra Gaúcha, or Rio Grande do Sul, don’t write off this little-known delight. People in this region refer to it as “Another Brazil.” The locals—who are of Italian, German, Austrian, and Swiss descent—are cheerfully industrious, polite, and friendly. Streets, shops, homes, and parks are neat and tidy. Hydrangeas blanket every hillside, and flower boxes and beds decorate the town. While Canela isn’t well-known outside of Brazil, it is widely known among many Brazilians as a center for eco-tourism. Two large parks containing rugged canyons lie within a 10-minute drive of the town. Hiking, fishing, rafting, and rappelling are a few of the activities available. Even if you aren’t an outdoorsman, you’ll appreciate the spectacular vistas. This is a wonderland for nature photographers. And foodies will absolutely love Canela. The area produces beef, plus a wide variety of fruits and vegetables. These fresh ingredients…as well as Brazilian, Italian, and German traditions together, yield delicious and extremely bountiful meals for very reasonable prices. Only four miles from Canela lies her chic sister city, Gramado, which plays host to numerous festivals and cultural events throughout the year. The Christmas/New Year’s season is closed with a spectacular Las Vegas-caliber show incorporating live song, lasers, fountains, and fireworks, all perfectly synchronized. But all this style comes with a price. Rents, restaurants, and shops are more expensive in Gramado than Canela. Maximize your budget by living in Canela and visiting Gramado to splurge. You can find a small furnished apartment in Canela for as little as $400 per month, and a two-bedroom furnished unit in a great location near the town’s centerpiece stone cathedral for less than $700. You can indulge at an all-you-can-eat buffet for less than $7. Save room for dessert, also included. You can walk most places in town, but there are taxis and a decent bus system, with regular buses shuttling between Canela and Gramado. The drawbacks? Size might be an issue for some. Although there are many activities in the area, both outdoor and cultural, these are small towns. 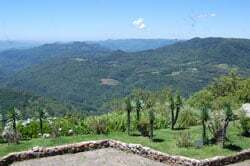 Canela has only about 40,000 inhabitants, and Gramado about 36,000. Canela also lies at the south of Brazil, at some distance from North American cities. Finally, weather is another. This area experiences true winter, with temperatures at times dipping to freezing, and a light snow dusts the area every two or three years. Despite these considerations, I find Canela, and its people, truly delightful—so much so that I will move there later this year. Whatever you are looking for in a retirement spot, Brazil probably has one right for you. But which one? Come and explore for yourself! Learn more about Brazil and other countries in our daily postcard e-letter. Simply enter your email address below and we’ll send you a FREE REPORT: The World’s Best Beachfront at an Affordable Price in Brazil. This special guide covers real estate, retirement and more in Brazil and is yours free when you sign up for our IL postcards below.